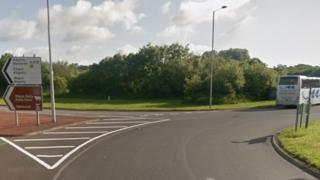 A 68-year-old man has died in a motorbike crash in Pembrokeshire. The motorbike was the only vehicle involved in the crash, which happened on the A477 Kilgetty roundabout at about 12:30 BST. The road was closed for several hours but reopened at about 17:00. The man was confirmed dead at the scene after the ambulance and fire services were sent to the roundabout and Dyfed-Powys Police is appealing for information.